By Mrs. Bettie Shelby, widow of General Shelby. The accounts of the women of Civil War Missouri are more rare than those of the men but often give greater insights into the war on the homefront. This was not a war fought only on distant battlefields but right within the homes and communities of the people of Missouri. The women were vital participants on both sides of the conflict. They showed a stoutness of spirit and resolution equal to that of any battlefield warrior. In Missouri Rebel women were material participants as couriers, spies, in providing aid and succor to the men operating behind the lines. Bettie Shelby, wife of Missouri Confederate General Joseph O. Shelby remained behind for a time, then followed her husband south in his camps. After the war she followed her husband into Mexican exile. The account she gives here of her wartime experience is scanty and barely touches upon the many adventures and experiences she had during the war. A fictional account (though based on solid research) of Bettie Shelby’s wartime experiences are told in “Save Weeping For the Night” by Loula Grace Erdman, who grew up in Lafayette County, home of the Shelbys. The book is, unfortunately, out of print, but copies are available used from ABEBOOKS. Just click “go” on the search box to see available listings. The early years of the war between the states found me, still a girl in years, with two children, as I had married at the early age of sixteen. 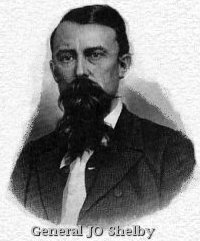 General Shelby, who had refused many tempting offers to join the Federal army, organized a company from the flower of Howard county, and proceeded to join General Price at Springfield. Myself and children were left under the protection of an aunt, a high-spirited woman, who had sent several sons to the southern army, and when taxed by the Federals with furnishing altogether too many rebel soldiers, she boldly retorted that if she had a hundred sons they would all be there. Many threats were made to burn out this nest of rebels. Frequently as many as twenty-five soldiers would appear and order a meal of the best we could produce, which we dared not refuse, else our smokehouses would have been raided and nothing left to us. My aunt provided a cot and nursed for several weeks, in the brush, one of our men who had been badly wounded. A surgeon came surreptitiously in the night and set a broken bone. My aunt went every day and dressed the wound and sent him food. We were in daily terror lest the negroes should betray him, but they never did, and he recovered and joined the army. On another occasion two of our men were secreted under a dormer window in the top of the house. They had been traced there, and the Federals threatened to burn down the house if they were not produced. Had they carried out their threats our friends would have been shot down in endeavoring to escape. Soon, however, we had to leave our homes, and finally when General Shelby’s raids became more frequent hail to leave the state. We first went to St. Louis, where we were somewhat protected because of the relationship, between General Shelby and Frank Blair, but the authorities feeling that Shelby’s raids would be less frequent if his family was out of the state, we were completely banished. I went to my husband’s relatives in Kentucky. Later, when General Steele was operating in Arkansas and Louisiana, I started in company with another lady, accompanied by our colored maids, for the south. It was suggested that our nurses might desert us on occasion, consequently we had their trunks placed in close touch with us as a precaution after boarding one of the river boats for Memphis. As our maids did not appear as usual in the morning our first move was to see if the trunks were still there. They were gone. And we were left to battle with the babies as best we could. On arriving at Memphis we were held for three weeks at a hotel. We suffered untold trials getting through the lines at all as there was fierce fighting raging around Little Rock and vicinity. We were finally, in company with other refugee families from Missouri, placed at Clarksville. Tex., where we remained until the close of the war. As Shelby’s command could not carry the Confederate flag into Mexico, a consultation was held, and it was decided that they should bury it beneath the waters of the Rio Grande, which they did. I have heard General Shelby speak of this disposition of the flag frequently as a matter of fact. The soldiers all gradually drifted back to the old homes, or rather where they had stood, but where now was nothing but ruin. We now settled in Bates county, where we reared a large family of children and lived happily until my husband passed away. He left me several sons and one daughter to mourn his loss. Yearly at the memorial services in the beautiful Forest Hill cemetery may be seen, in company with the family, an aged faithful body servant, now the coachman, paying a beautiful tribute in flowers to his former master.